41st Anniversary Celebration…Fireworks, Flames and FUNNY CARS! but unveiled in a never been seen before NIGHT UNDER FIRE Show! THE ULTIMATE EPIC BATTLE BETWEEN TWO OF THE BADDEST JET TRUCKS ON THE PLANET…MOTZ VS SHOCKWAVE! Have your cameras and phones fully charged and ready to film! The North American Jet Car Championship – Elevent CARS, HANDPICKED, FROM ACROSS NORTH AMERICAN WILL ASSEMBLE TO QUALIFY FOR AN 8 CAR FIELD TO RACE FOR THE CROWN OF THE NORTH AMERICAN JET CAR CHAMPION! 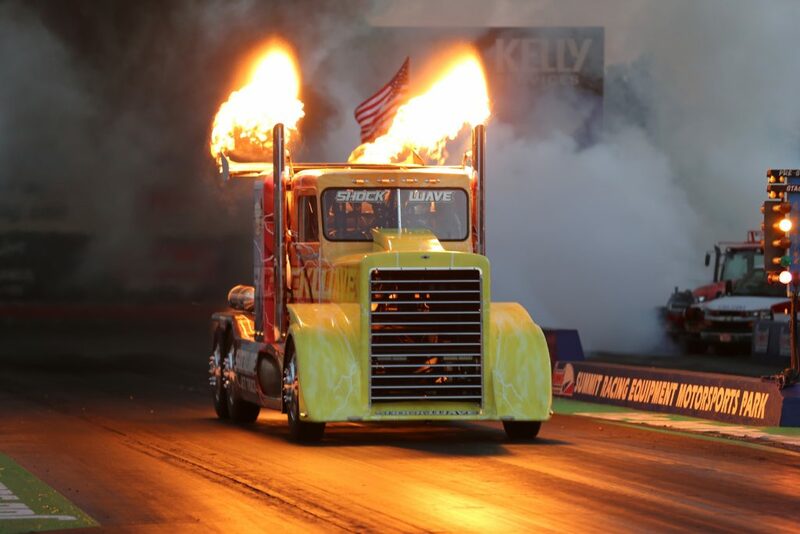 8,000 HORSEPOWER 4-Second, 320 mph NHRA Fuel FUNNY CARS…are a staple at the Kelly Services Night Under Fire. 16-Time NHRA World Champion, JOHN FORCE, will be joined by current reigning NHRA World Champion Robert Hight, Tim Wilkerson, Del Worsham, Dale Creasey Jr and one more to be named. These drivers will give you a NITRO EXPERIENCE you will never soon forget! You will feel their 8,000 horsepower machines deep down inside your chest, from the time they launch until they let off the throttle! $100,000 FIREWORKS SHOW, presented by R&R AUTO BODY! Among the longstanding traditions at Summit Motorsports Park are the explosive and encompassing fireworks offered at the conclusion of the show. Fireworks are ignited from multiple locations for improved impact, and in red, white, blue and other colors, they dance to carefully-choreographed patriotic music that is both inspired and inspiring. Designed to be dramatic as well as delightful, they’re known to be far grander than those of neighboring cities, and just when it appears that the last of them has been seen, heard and felt, gas bombs reverberate throughout the facility, leaving fans flabbergasted. The nearly fifteen minute spectacle costs over $125,000 to produce and leaves no wonder as to why it’s now famed and fabled. THE NOSTALGIA PART OF THE SHOW! THE LEGENDARY HEMI UNDER GLASS WHEELSTANDER TO PERFORM! When George Hurst expressed interest in having a car that would serve both as a test bed and showcase for his products, friend and editor of Hot Rod Magazine Ray Brock suggested the AF/X class (precursor to funny cars). Brock also suggested the new fastback Barracuda and the newly released 426 Hemi engine and that it be mounted in the middle of the car for weight transfer and traction. This was during the golden era of drag racing where altered wheel bases, wild creations, and “anything goes” attitudes were the norm. In its first appearance at the NHRA Spring Nationals the Hemi Under Glass stunned and thrilled the crowds with 300’ wheelies. This event forever changed the course of the Hemi Under Glass from racer to the first ever exhibition wheelstanding car and the rest is history! Today, the Hemi Under Glass is recognized as the most famous exhibition car in the world and will appear at this year’s Night Under Fire with new driver Mike Mantel. The supercharged ’68 Cuda that Mike will be piloting is the longest performing Hemi Under Glass ever constructed. The car has performed at the Goodwood Festival of Speed in England, the US Nationals, and has even match raced the Little Red Wagon. Don’t miss this rare opportunity to see this American icon in action at Summit Motorsports Park! Four period correct legendary Pro Stock cars will race down the quarter mile once again: Rod Shop’s Colt, Warren Johnson’s Firenza, Bob Glidden’s Plymouth Arrow and Rickie Smith’s Ford Thunderbird. Before there were funny cars…there were gassers! Eight to ten period correct, ill-handling, short wheelbase gassers will skate down the quarter-mile entertaining fans like they did back in the good ol’ days of drag racing! Many of these hotrods will even have those famous B.U.G.s (Back up Girls) to help them stage! This too will be a two round show, with the first round being a qualifier. The final round will start with the slowest pair and concluding with the fastest two qualifiers racing for the gold! NOSTALGIA DRAG RACING LEAGUE IS BRINGING THEIR 200MPH Pro 7.0 CLASS! They will compete to be the first to the finish line, without running quicker than 7.00! Two rounds of qualifying followed by eliminations. Winner takes all! FOR MORE INFO INCLUDING SCHEDULE OF EVENTS, ONSITE AMENITIES, AND TICKET INFO, CLICK HERE! Just as the name implies…outrageous, ill-handling door cars skating dangerously down the quarter mile, draggin their bumpers on the asphalt along the way, occasionally changing lanes and swapping a little paint! This is drag racing with an attitude…Where a win on your roof can still be a win! We will have the Fastest and Most Unpredictable Pro Mods, from the four corners of the USA, assemble at one time, each wanting the Guaranteed top prize of $40K. And, if brave enough to try, can take home another $5K by winning the Money Shot during qualifying. Shakedown is the event where it is always dynamic and never static! 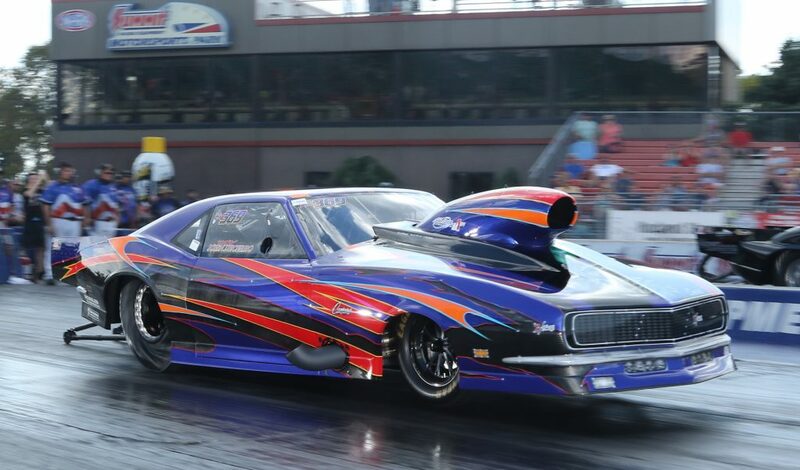 Anything can happen in a blink of an eye, when erratic Pro Mods exceed 250 mph in the 1/4 mile! The complete set of rules and the rules for each race class are listed below. Click on the appropriate file. Also racers can pre-register by Wed September 4, 2018, by clicking the Pre-register file below. **NOTE: If you are planning to pit next to another racer, you MUST submit your pre-registration forms in the SAME ENVELOPE! HORSEPOWER WARS $10K DRAG SHOOTOUT! With $3,000 cash and an additional $7000 in Summit Racing Gift Cards. One can build a very fine hot rod! Four teams will be selected to travel to California in July, to build a car that will compete during this year’s Shakedown at Summit, live on SpeedVideo.com. The overall winning team wins a $10,000 purse and gets to keep their car! Get to know the nine $10K Shootout Finalists. Kurt Johnson with Total Venue Concepts, will be teaming up with Summit Motorsports Park to assist in the continued success of this event. In addition to his track prep experience, Johnson will be bringing his rotating drag, Hook Master 8400 static drag and Hook Master traction compound sprayer to ensure that track conditions are suitable for both big-tired and small-tired vehicles. We welcome Lee “TEC” Sebring, to the announcer’s booth! Sebring, who’s famous for his factual yet fun delivery has agreed to announce at this year’s Shakedown at the Summit! Lee earned the name “TEC” an acronym for “top end charge,” when he was announcing for the Yellow Bullet Nationals. He would excitedly exclaim “top end charge” when a car was laying down a substantial amount of power near the finish line. We look forward to working and listening to Sebring’s high-energy commentary at this year’s event! SpeedVideo will be providing Live Coverage all weekend long. Summit Racing Equipment Shakedown at the Summit XV presented by Mickey Thompson recorded Over 2.5 Million Minutes of viewing and had over 450,000 views making it their 2nd largest broadcast of 2017! Click here to SpeedVideo.com for more details. Back by popular demand, Trainwreck Country Band, playing modern country and rock covers, will play a live concert, immediately following the last session of qualifying on Friday Night. Plan on hanging out with the racers for a couple of hours listening to great music underneath the Budweiser Grandstands. Every day a Special Event Takes Place during the Halloween Classic…The Classic is more than just a big race! It’s a WEEK LONG PARTY! It all starts, Saturday October 13! Pre-Racers can move-in based upon their pre-registered entry number. Wednesday October 17th, the road leading towards the crowning of the 2018 Overall Classic Gremlin Grand Champion begins at 8:00 a.m. Each class will receive one time run; then “all run” Fleenor Transmission No Box Gambler’s Race will start at Noon, followed by Callies Performance Products Box Gambler’s Race. Wednesday’s gambler races are all run fields! Are you funny? Do you like to write and tell jokes? Do you aspire to be a comedian? We’ll give you an opportunity to try during the Mickey Thompson “Token Joke Day”, Thursday October 18th! All you need to do is submit your best joke, (written ideally on paper!) and bring to race control during the course of the day on Thursday. Either you or one of our announcers can or will read your joke(s). To protect delicate psyches, we reserve the right to edit and or otherwise sensor “crass” submissions! Our panel of judges will review all entries to determine the winner. The winner will receive a set of Mickey Thompson Rear Slicks! 2017 winner, Dustin Tackett, Shelby OH. Friday October 19th is Trick Flow Specialties “Limerick Day”, which allows all of our creative writers to craft a poem that involves drag racing! The poem must follow the standard limerick style and cannot be longer than 5 lines. All entries must be submitted to race control by end of the day in order to be read over the PA and to be considered a candidate. The overall winner will receive one Trick Flow Track Heat Carburetor. Our 2017 Winner was Dan & Michelle Dynmek, Shelby Twp, MI. It wouldn’t be Halloween without carved pumpkins, so we’re having a Pumpkin Carving party in the Fellowship Tent from 2:00 p.m. to 6:00 p.m. We will supply the pumpkins; you bring the utensils and the creativity! All the carved pumpkins will be used to decorate the park on Saturday! You are welcome to take your creation home with you on Sunday! BACK BY POPULAR DEMAND! TRAINWRECK COUNTRY BAND performing live Friday Night after the races, thanks to Empty Pockets Motorsports Promotions; Racing RV’s, V’s House of Horsepower and Paradune Brewing Company! “Fright Night”, the largest Drag Racing Halloween Party in the world, begins when the sun rises on Saturday October 20th! Everyone is in costume; the facility and pit areas will be decorated with a Halloween theme. It’s not only a full day of racing, as we will begin first round of eliminations, there will be a lot of partying going on as well! Hayrides for kids of all ages will begin at 1:00 p.m. Rides will leave from the Fellowship Tent. 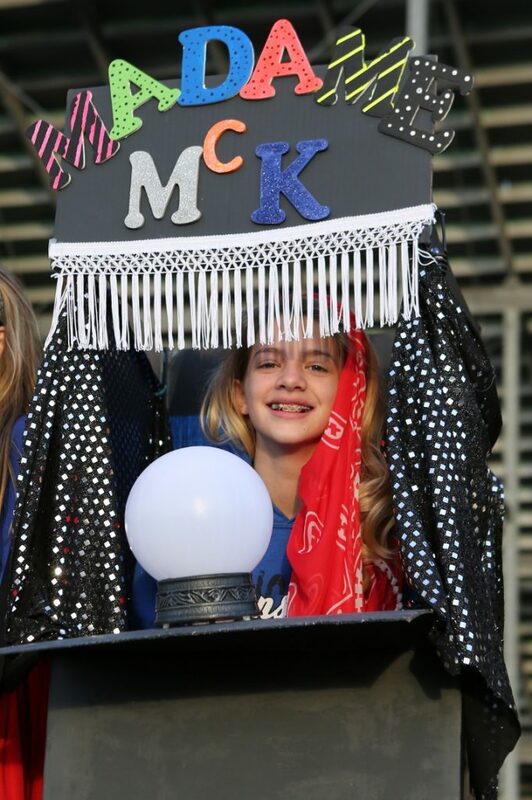 Thermo-Tech Kid’s Halloween Costume Contest,presented by Kelley’s Island Venture Resort begins promptly at 5:00 p.m. All kids will receive a participant ribbon for just dressing up. Trophies will be awarded to the top 3 in five different categories (prettiest, scariest, most original, cutest and hand made), between two age groups (1-6 and 7+). During the week, racers will begin designing, building and decorating their race rigs and pit areas in a theme they hope will capture the judges attention so they can take home a Classic Gremlin Trophy. Judging of pit areas and race rigs will take place Saturday late afternoon between 5 and 8 p.m. All entries must be registered in guest services (on the side the display is pitted on) by Saturday at 3 p.m., so our judges do not overlook your area! 2017 Best Decorated Pit Area was awarded to Barbara Farmer, Belleville MI “Cemetery with Mausoleum”; Best Decorated Rig went to Anderson/Bennett Families, Norwalk OH “House of Horrors”. The highlight of the day for the kids arrives at 7 p.m. when all motorized traffic comes to a screeching halt as the ‘witching hour’ begins. For one hour, kids of all ages can visit over 1,000 homes for ‘trick or treating’. Kids you are going to need pillowcases and wagons to carry all the candy you can collect! You’ll even get to explore haunted trailers and pit areas along the way! But what about the Big Kids…don’t worry we didn’t forget you. The Gordon Food Service “Adult Witching Hour” which includes an adult costume contest and a free dinner begins at 8 p.m. The overall winner in each of the following categories: funniest, most original, scariest and sexiest, will take home a Classic Gremlin. The fun doesn’t stop there. We go back track side for the ever popular ‘Trick Flow’ Bumper Draggin’ Air Show, $500 and a Classis Gremlin will be given to the racer who performs the highest wheelie and to the racer who can carry the wheelie the furthest! The 2017 Furthest and Highest winner was rained out! Mother Nature didn’t play nice that evening! Moto Lenz Photos provides the winners of the Wheelie Contest a poster of their car! Sunday, October 21st is Survivor’s Day! All classes will run to completion, including Injector Experts Last Chance Race, where the four best losing reaction times from round #1 in each of the four classes will have an opportunity to win $500! After all the class champions have been crowned, each class champion will then race off to see who will be our next Grand Champion! The overall winner will have four prize packages to select from as your reward in addition to the Classic Gremlin! The 2017 Grand Champion Winner was Edelbrock Super Pro racer John Boes, Alvada OH. The Winner will receive $500 dollars in cash & $500 dollar Summit Racing Gift Card, plus a special one of a kind trophy! The Runner-Up will receive $250 dollars in cash & $250 dollar Summit Racing Gift Card. Each Semi-Finalist will receive $100 dollars in cash & $100 dollar Summit Racing Gift Card. As a special “double-up” bonus, should the winner of the Trick Flow Ultimate Performer also win their class at the Halloween Classic, they will win an additional $500 in cash & $500 Summit Racing Gift Card. The Halloween Classic presented by Harland Sharp entry forms will be mailed in late August 2018. If you do not receive mailings from Summit Motorsports Park and wish to be part of this fun filled week, then click here to join our mailing list or call the office at 419-668-5555. And specify you wish to receive a Halloween Classic brochure in the comment box. We encourage racers to pre-enter for a number of reasons, one it will determine what time you can arrive on Saturday October 13th! Secondly the Thursday and Friday gambler’s races have limited fields. Entries can only be accepted via walk-in (during business hours), overnight/next day mail and regular mail. No entries will be accepted in person after 3pm on Friday October 12th. Click to see which session you can enter into Linder’s Lot on Saturday October 13th. Entry number was determined based upon when your Halloween Classic entry was received. Search either by Last Name or by Entry Number. List will continue to be updated every few days, to accommodate new entries.